Our mission at TMJ Therapy & Sleep Center of Nevada is simple. We provide restorative dental treatments in Reno that promote health and wellness. To achieve this, we combine the perfect blend of education, communication, and modern technology. Dr. J Brian Allman and our accomplished team devote hundreds of hours each year to training and education. Learning about new technologies and treatment developments allows them to incorporate innovative concepts into their dental implant treatment. If you have missing teeth and are looking for the healthiest restorative option, call our office today to set up an appointment. When a patient experiences significant decay or dental trauma, an extraction may be necessary to alleviate pain and restore proper function. Once teeth are removed, it’s necessary to fill in gaps with restorative prosthetics, preventing neighboring teeth from shifting into the empty space. Having dental implants placed offers the healthiest option to restore function and beauty. 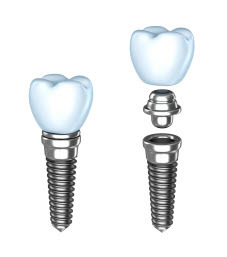 The dental implant procedure involves precisely positioning a titanium post into the jawbone. This post serves as the natural tooth root, providing stability and permanence for crowns, bridges, and dentures. Our office in Reno is furnished with state-of-the-art technology that allows us to perform any dental procedure, regardless of its complexity. For the utmost in quality digital imaging, we use Omnicam® to capture your impressions. Additionally, ICAT FLX® cone beam computed tomography allows our dentist to place implants precisely. This machine is the latest in CBCT, providing quality three-dimensional images of your entire dental structure with comfort and ease. Dr. Allman’s extensive training and education, combined with our technologically advanced office, provides our patients with the convenience of one team restoring your smile. This is especially beneficial to our patients undergoing dental implant treatment, as the entire process can be completed right in our office. In addition to these services, if you don’t have the necessary jaw tissue to support a dental implant, we perform bone grafting. We also offer ridge preservation procedures to maintain the jaw between extraction and the placement of the implant. For over three decades, we at TMJ Therapy & Sleep Center of Nevada have been passionate about restoring health and function to patients’ smiles. Dr. Allman and our dedicated team enjoy providing patients with quality dental implants in Reno, Sparks, and Carson City. Call us today for an appointment!